Our parish has recently hosted two retreat days for young people belonging to the Melkite Catholic parish in London. 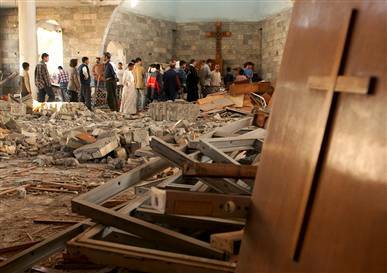 Fr Shafiq, the Parish Priest, has written to ask for our prayers for the Christians of Iraq, whose ancient churches are being destroyed, whose houses are marked for destruction, and who are being given the choice of flight or death. The event will be covered by the media. Please attend if you possibly can and encourage your friends and family to do same. During his Sunday Angelus, Pope Francis told the persecuted Christians of Mosul that he was with them in solidarity, urged the faithful to pray for them, and appealed for aid for these people who have been “stripped of everything“. After the Islamic State of Iraq and Syria (ISIS) threatened to kill them if they don't convert to Islam or pay tax, they began implementing their threats by burning a 1,800 year old church in the city. 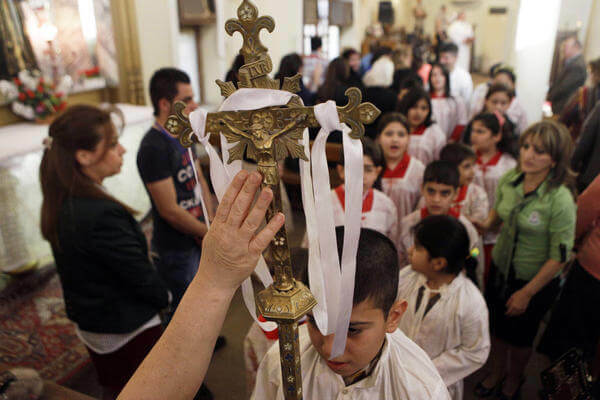 One small hopeful development was witnessed yesterday, however, when Baghdad Muslims reached out in solidarity to their Christian brothers and sisters, joining them at the end of Mass on Sunday for a special service in the Church of Mar Girgis. Many bore signs that read “I am an Iraqi Christian”. "To the people of conscience and good will in Iraq and the world. The takeover of the Islamist jihadists of Mosul and their announcement of an Islamic state, and after days of composure and anticipation, the situation had turned negative on the Christians of the city and surrounding areas. The first signs of this reversal were the kidnapping of the two nuns and three orphans who were released after 17 days, We were encouraged by this development and we considered it a glimmer of hope, and a breakthrough. Only to be surprised by the latest developments, the Islamic state issued a statement calling on Christians openly to convert to Islam, and either pay Jizya without specifying a ceiling, or leave their city and their homes, with their clothes only, without any luggage, and issued a "fatwa" that the homes will become the property to the Islamic state. They have marked the letter "N" on the homes of Christians for "Nazarenes"!!! As they have marked on the homes of Shiites with the letter (R) for "Rejectors". Who knows what is holding in the coming days as the laws of the Islamic state is based on what they claim to be the Sharia law, including the redefinition of identities on the basis of religion and sectarianism. These requirements offend Muslims and the reputation of Islam, which says "you have your religion and we have ours," and "There is no compulsion in religion", and it is in contradiction of a thousand and four hundred years of history and a lifetime of the Islamic world, and coexistence with different religions and different peoples, east and west, respecting their beliefs and living in fraternity. The Christians and in particular in our East, and since the advent of Islam, have shared together sweet and bitter memories, their bloods were mixed in defence of their rights and their land, and together they built, cities, civilization and heritage. It is shameful that Christians are being rejected, expelled and diminished. It is obvious that this would have disastrous consequences on the coexistence between the majority and the minorities, even among Muslims themselves, in the near and long term. Hence, Iraq is heading to a humanitarian, cultural, and historical disaster. Therefore we call unto them, a warm, brotherly, urgent and serious call, and we appeal to our fellow Iraqis who support them to reconsider their strategy, and respect the unarmed innocent people, of all ethnicities, religions and sects. The Quran commands respect to the innocent, and does not call to seize the property of people forcibly, it calls on helping the widow, the orphan, the destitute and the defenseless, and even recommend to help the seventh neighbour. We also call on Christians in the region to adopt rationality and acumen, and calculate their options well and understand what is planned for the area, and come together in love and think through together and in solidarity to build confidence in themselves and their neighbours, gathering around their church, being patient, enduring and praying until the storm passes."